Today, electric fireplace suites lend interest and warmth to numerous buildings. 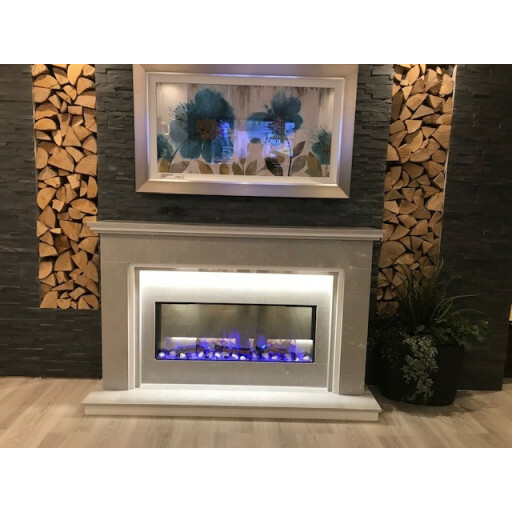 Whether someone seeks to decorate an upscale apartment or a hotel, or a designer requires a trendy décor accent for a business, the lovely Marble Astrack Fireplace Suite furnishes an excellent choice! Visit the Fireplace Warehouse either online or in person to fully appreciate the beauty of this popular inventory selection. The Marble Astrack Fireplace Suite includes an attractive fireplace mantelpiece covering a hearth shaped like a rectangle. Its brilliant flame bed contributes to the ambience of virtually any room. Use it to welcome guests to a living room or a parlour. This fireplace suite also enhances commercial lobbies and business reception areas. It combines important aesthetic properties with an aura of luxury and warmth. The manufacturer designed this suite using polar white and Italian grey components. Both colours blend attractively into most interior decorating plans. The fuel bed supplies a rich purplish glow, perfectly complementing white pebble accessories in the background. Owners possess the capability to adjust the flame colours to elicit bright yellow accents in the display. The wide long mantle provides a great location for highlighting memorabilia or decorative items. Customers place this suite flush against a wall or inside a chimney nook. The lovely Marble Astrack Fireplace Suite promises many hours of warmth and pleasure!